Did you know that 7 seasons of excavations (2007-2013) at Khirbet Qeiyafa have produced a number of exciting finds leading some archaeologists to the conclusion that the biblical description of David’s kingdom is accurate? If you are a Bible-believer, it may have never crossed your mind to doubt the existence of David or his kingdom. However, that hasn’t stopped skeptical archaeologists and biblical scholars from questioning it! In the 1980s the new “literary” approach to the Bible advocated that the biblical text was written centuries after the events they purport to describe (actually the old “higher criticism” of the 19th-20th centuries frequently advocated a similar understanding). The events and people were (are) often considered to be literary creations. The biblical authors merely fabricated a past history that didn’t actually exist. 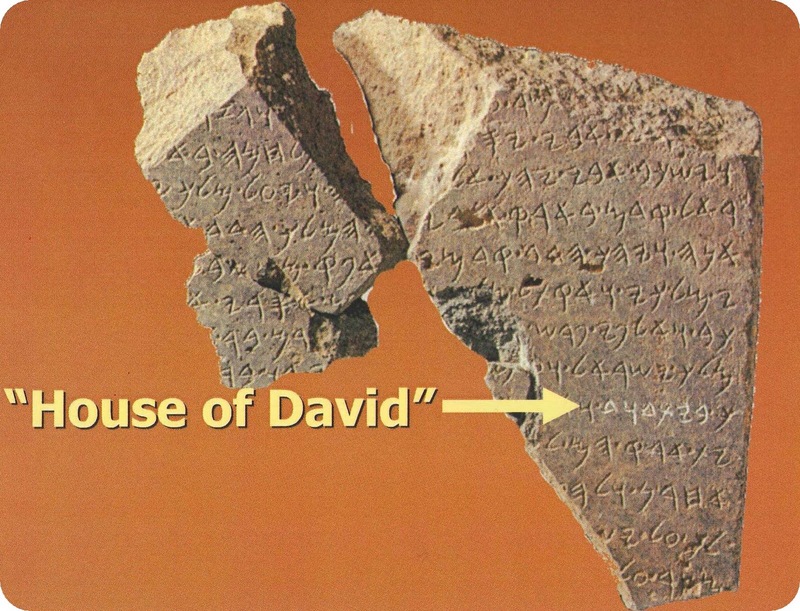 The discovery of the stele (stone inscription) from Tel-Dan in 1993 which specifically mentions the “house of David” was the first nonbiblical source ever discovered to refer to the Davidic kingdom. This discovery was helpful in putting an end to the theory that King David was only a literary creation. However, a number of scholars continue to believe that David’s kingdom was insignificant. One prominent Israeli archaeologist summed up David’s kingdom this way: “500 people with sticks in their hands shouting and cursing and spitting.” (quoted from Biblical Archaeology Review, Nov/Dec 2013, 39, no. 6, in an article by Yosef Garfinkel, Michael Hasel, and Martin Klingbell entitled “An Ending and A Beginning,” p. 44). The excavation of Khirbet Qeiyafa takes an important step toward demonstrating that David did in fact rule over a significant kingdom. While not all scholars agree (when do they ever! ), there is considerable evidence that this city, that overlooks the Elah Valley, was an important defensive outpost from David’s time (1010-970 BC). 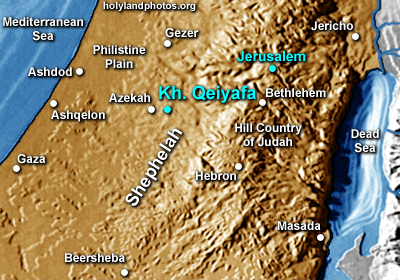 As the map below shows, Qeiyafa is located at the junction between southern Judah and Philistine territory (the Philistine city of Gath, not on the map, is only 8 miles away). The Elah Valley is the famous location of David’s battle with Goliath and it is the valley which provides access from Philistine territory to Judean territory. Thus it is a significant area, and Qeiyafa’s location would have been vital in protecting Judah’s southern frontier. The reason Khirbet Qeiyafa is so significant is because there is basically only one occupational layer. This means that, unlike many cities in Israel, the site was not built upon by later generations (there is some small evidence of other occupations of the site, e.g., a Byzantine structure that dates from about 400 AD, but nothing significant that interferes with the basic city itself). Radiocarbon dating of ancient olive pits found on the site date it to the period of 1020-980 BC (David’s time). The city is constructed like other cities in southern Judah of this period (e.g., Beersheba, BethShemesh), a style which was unique to Judah (i.e., different from Philistine, Canaanite, or even Israelite construction). The discovery of two gate complexes (a southern entrance and a western entrance) leading into the city is unusual and has led the excavators of Khirbet Qeiyafa to identify it with the biblical city Shaaraim (which means “two gates” in Hebrew) referred to in the story of David and Goliath (1 Sam. 17:52). One of the exciting discoveries at Khirbet Qeiyafa was made in 2008 when an ostracon ( a piece of ancient pottery) was discovered with what may be the oldest Hebrew inscription ever found. The first photo above shows the area where the ostracon was found (see the yellow circle in the photo). Unfortunately, it has proven hard to translate because it is only a fragment of a larger inscription. However, scholars believe the words “judge” and “king” are among the words on the ostracon. The reason this is such an exciting discovery is that it provides evidence of writing, and therefore, of administration at Khirbet Qeiyafa. For a kingdom to be as advanced as the Bible describes David’s kingdom, there would have to be written documentation and administrative activity. 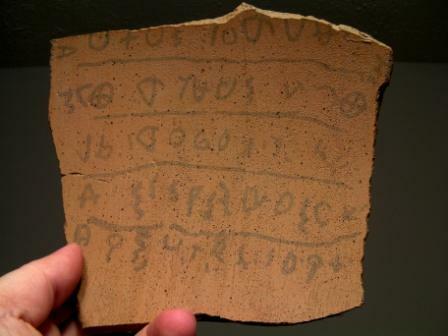 This ostracon provides for that possibility. Besides the two gate complexes, Khirbet Qeiyafa has a massive defensive (casemate) wall around it. In the final season of excavation (summer 2013), the excavators uncovered a monumental administrative building in the central and highest part of the site. Although the building had been partially destroyed by a later Byzantine structure (mentioned above and seen in the photo below), the archaeologists were able to determine that the original building from David’s era covered more than 10,000 square feet! The point of all this is, to build a city of this size and sophistication so far from Jerusalem, on the border of Philistine territory would have required a well organized and equipped government. 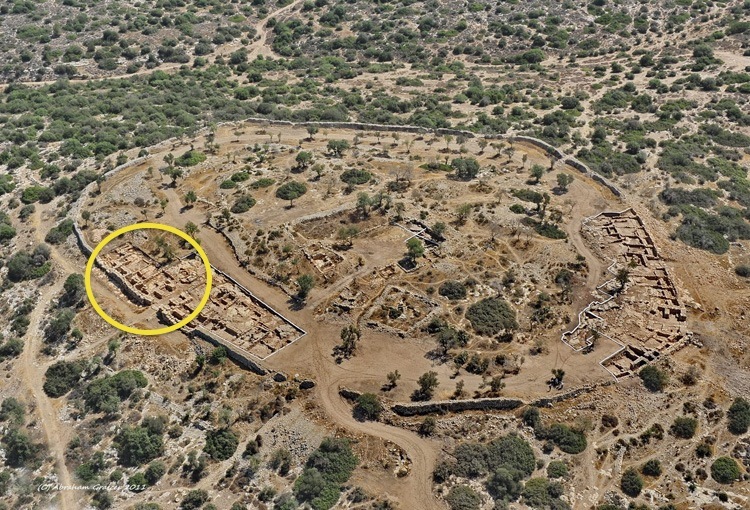 Summing up the significance of Khirbet Qeiyafa, the archaeologists of this 7 year project state: “Khirbet Qeiyafa redefined the debate over the early kingdom of Judah. It is clear now that David’s kingdom extended beyond Jerusalem, that fortified cities existed in strategic geopolitical locations and that there was an extensive civil administration capable of building cities. The inscription indicates that writing and literacy were present and that historical memories could have been documented and preserved for generations” (Biblical Archaeology Review, “An Ending and a Beginning,” p. 46, see the full citation above). Khirbet Qeiyafa (like the discovery at Megiddo mentioned in the last ariticle) continues to demonstrate that there is much to be learned from archaeology in Israel and that we shouldn’t be disturbed by some who claim that archaeolgy is “disproving” the Bible. In fact, it is interesting how frequently the biblical record finds corroboration in the archaeological evidence. The archaeologists of Khirbet Qeiyafa (Yosef Garfinkel, Michael Hasel, and Martin Klingbell) are moving to another important biblical site this summer: Tel-Lachish. Like Khirbet Qeiyafa it is located in the southern Judean foothills. 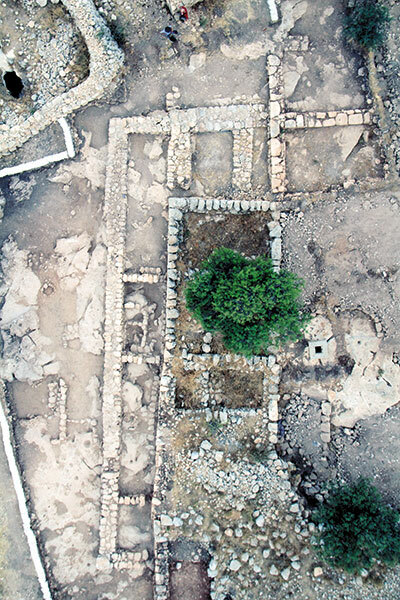 Although this city has experienced the archaeologists’ spade on several other occassions, the Davidic time period (11th-10th centuries BC) has received relatively little attention. It will be interesting to follow the progress of this dig and see what else can be “dug up” that relates to, and will deepen our knowledge of, the time of David. 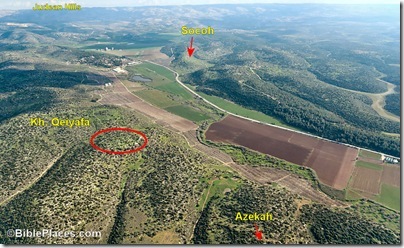 (if you would like more info on Khirbet Qeiyafa I recommend Luke Chandler’s site found at http://www.lukechandler.wordpress.com. Luke personally dug at Khirbet Qeiyafa for 5 seasons. Also, if you google Qeiyafa, you will find many other interesting photos and articles).